With equities seeing further swings today, the VIX itself was on the move, with a peak of 21.56 (with sp'1989), but settling -8.7% @ 18.66. 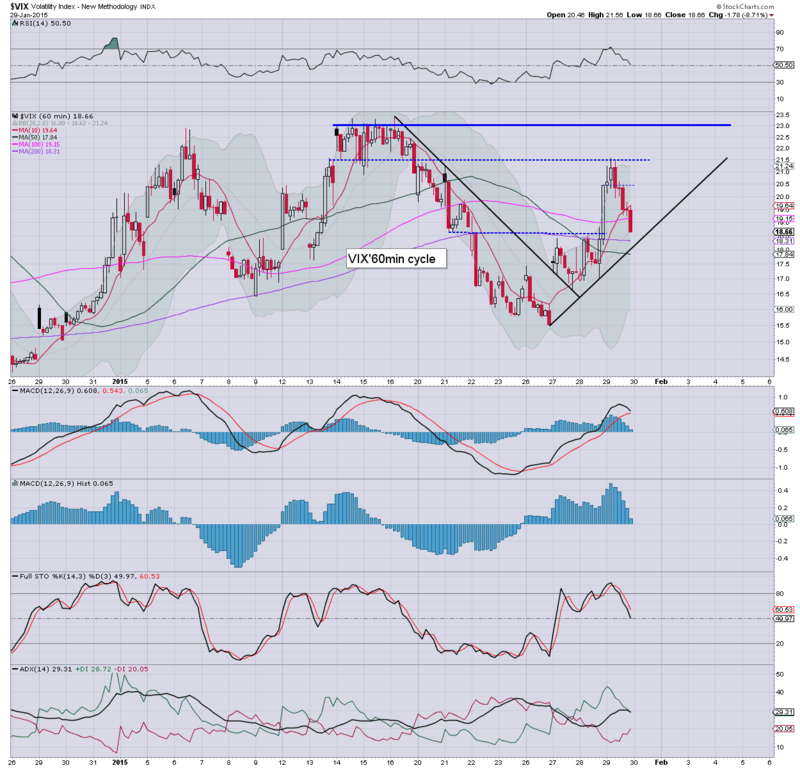 Near term outlook is uncertain, whilst there remains risk of a hit of the 200dma of sp'1973, which would equate to VIX 22/24. Things are uncertain in the immediate term. How we trade and close Friday/January.. will be rather critical. Arguably, equity bulls should be satisfied with any weekly close in the VIX <20... along sp >2000. US equities closed with somewhat significant gains, sp +19pts @ 2021 (intra low 1989). The two leaders - Trans/R2K, settled higher by 0.6% and 1.3% respectively. 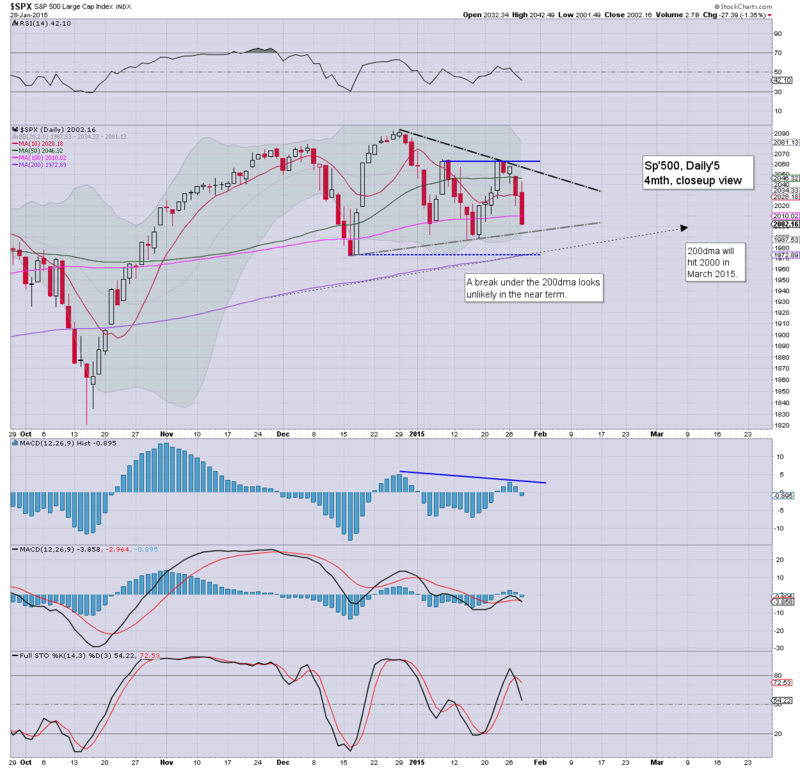 Near term outlook is uncertain, with threat of a hit of the 200dma of sp'1973... before renewed upside. *the last two hours of the trading day were somewhat of a mirror to yesterday afternoon. 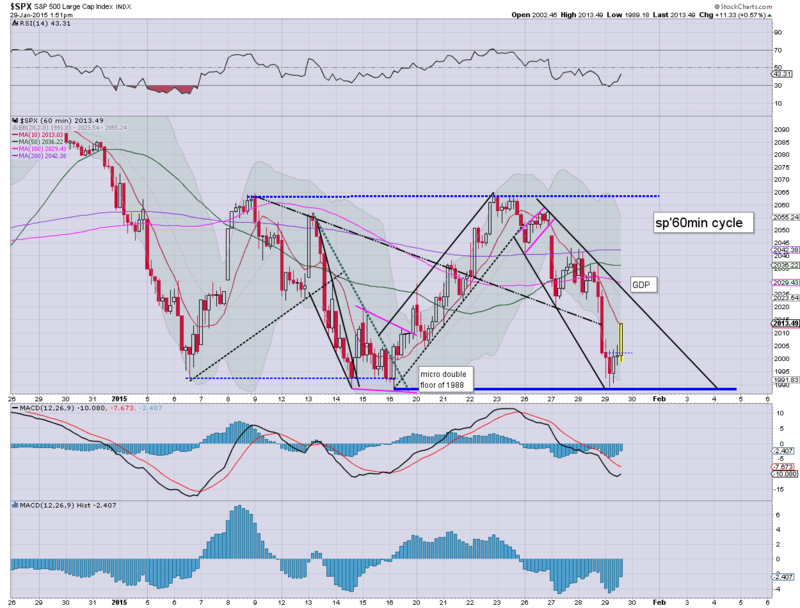 The break to sp'2024 is arguably a test of the declining resistance. A relatively tedious day.. were it not for the free entertainment provided via the precious metals market. All things considered, it remains something of a mess. Are the bulls going to be able to rally on GDP/PMI data into the sp'2030/40s... or will a renewed down wave take us to the 1970s? Friday will not be dull ! Regardless of the exact close, it has been another messy day in market land, very minor opening gains... a sell down to 11am (new cycle low sp'1989)... but latter day strength. Price structure is a bear flag on the smaller 5/15min cycles. Suffice to say... despite the latter day gains, I'm not confident the market is going to soar on 'isn't everything fine GDP/PMI' data. Best guess... a hit of the 200dma of sp'1973 tomorrow, before a rebound. However, I have LOW confidence in the near term. It is a real mess.. and borderline situation. 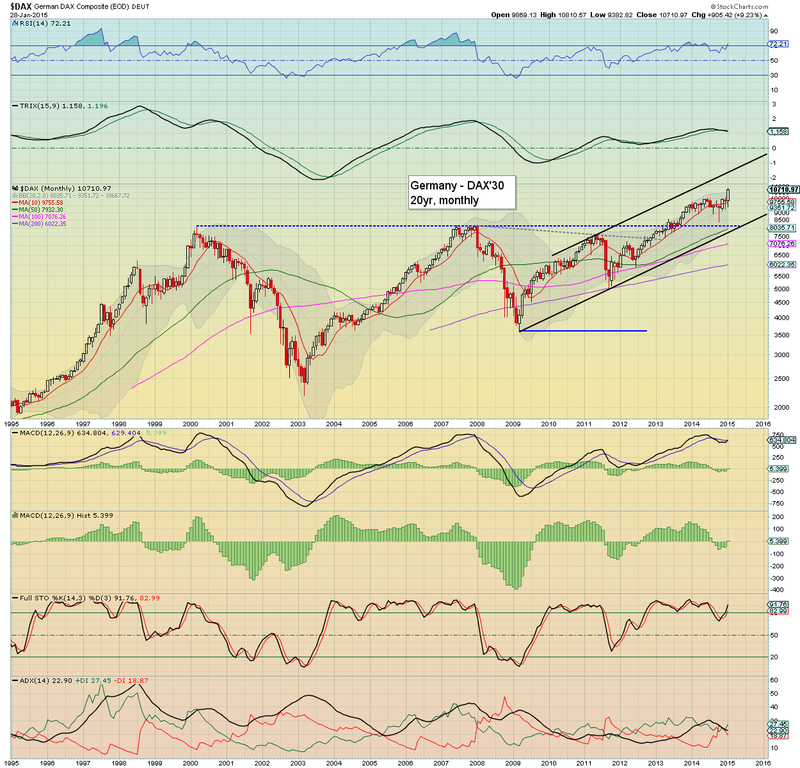 *a monthly/Friday close <sp'2000 will result in MARCON'6 for the sp'500... which would be the first bearish monthly close since Jan'2012. Notable weakness: FCX -4.3%, as the metals market is whacked. 3.27pm.. market making a play to break down trend... threshold is around sp'2022. VIX continues to cool. -7% in the upper 18s. 2pm update - a teasing bounce? 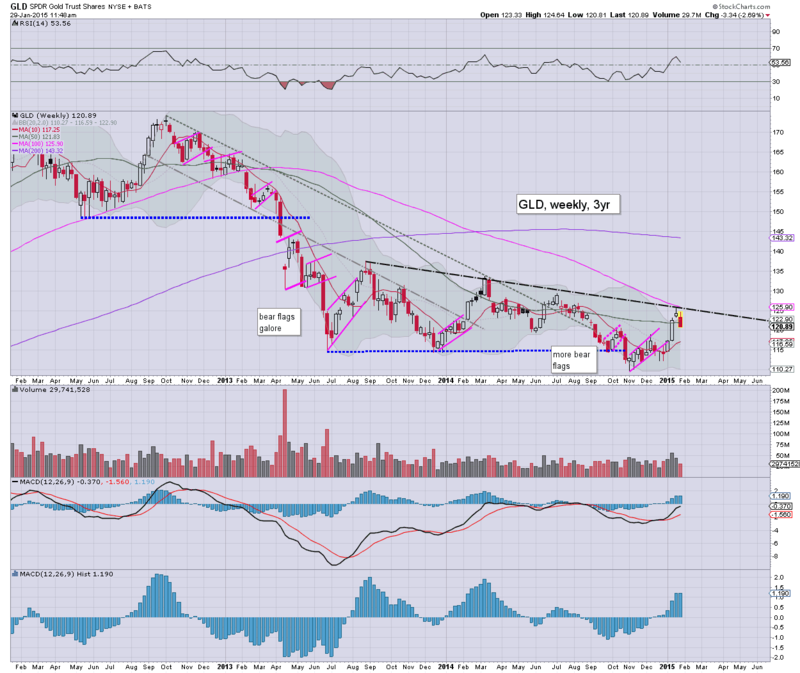 *The precious metals remain especially dynamic... and appear to be unravelling, having put in a multi-week peak. Equity bulls need to break sp'2022 at the close to have any real hope that a brief test of the 200dma is not on the menu before the weekend. Whilst equities see a minor up cycle - the sp'1970s remain very viable tomorrow, there is more interesting action in commodities. The precious metals are seeing some significant falls, Gold -$25, with Silver down a severe -5.6%. A multi-week peak looks to be in. *whilst equities are seeing some chop.. with a short term floor of sp'1989, I thought I'd highlight the metals, which are clearly seeing some pretty sig' downside today. The bigger weekly cycles look as though the up wave from early Nov' is complete. 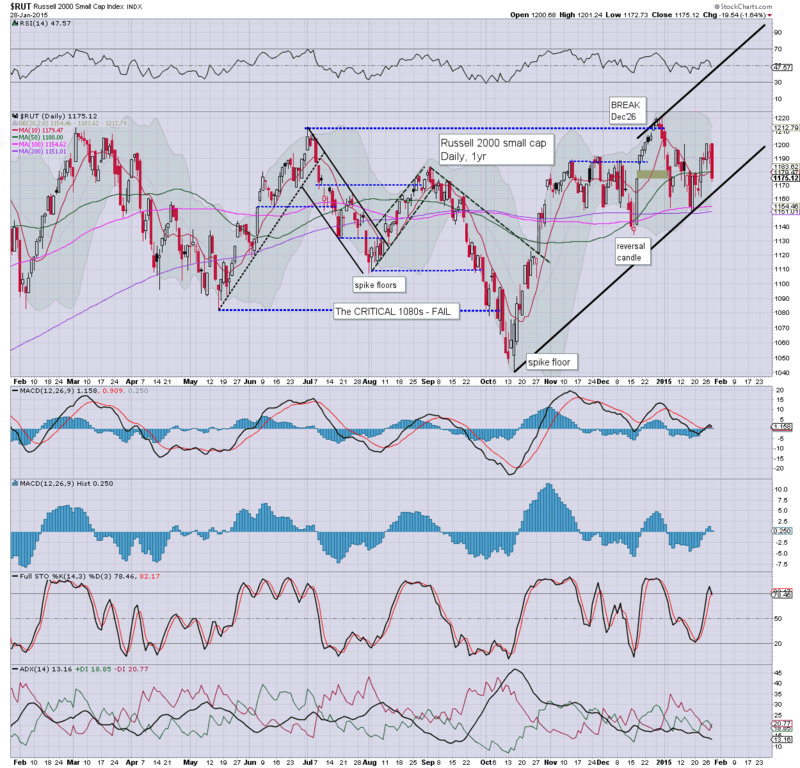 New multi-year lows look due into the spring. 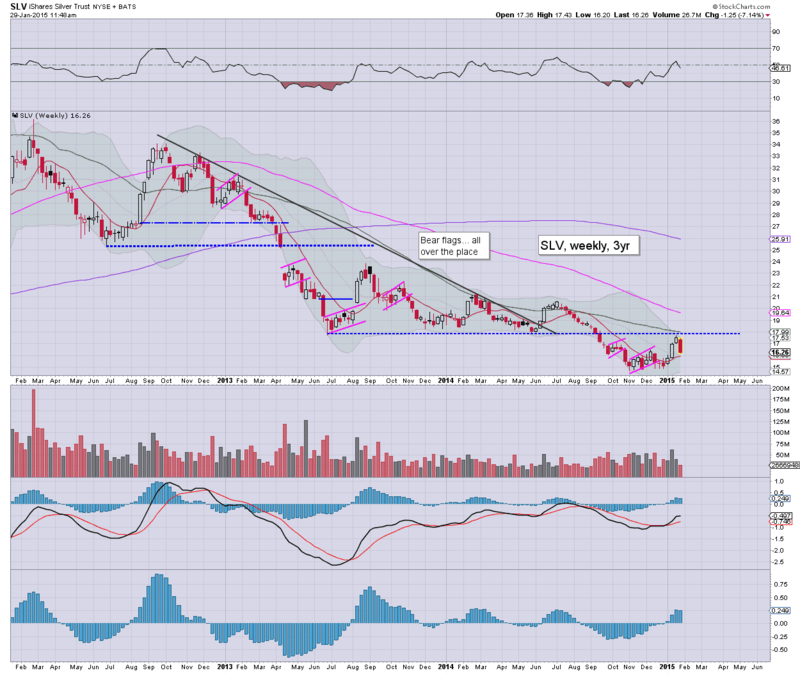 Considering that Copper is in the $2.40s, it is kinda surprising Gold isn't already around the giant $1000 threshold. Clearly, the 'fear bid' has recently helped to prop up the price. 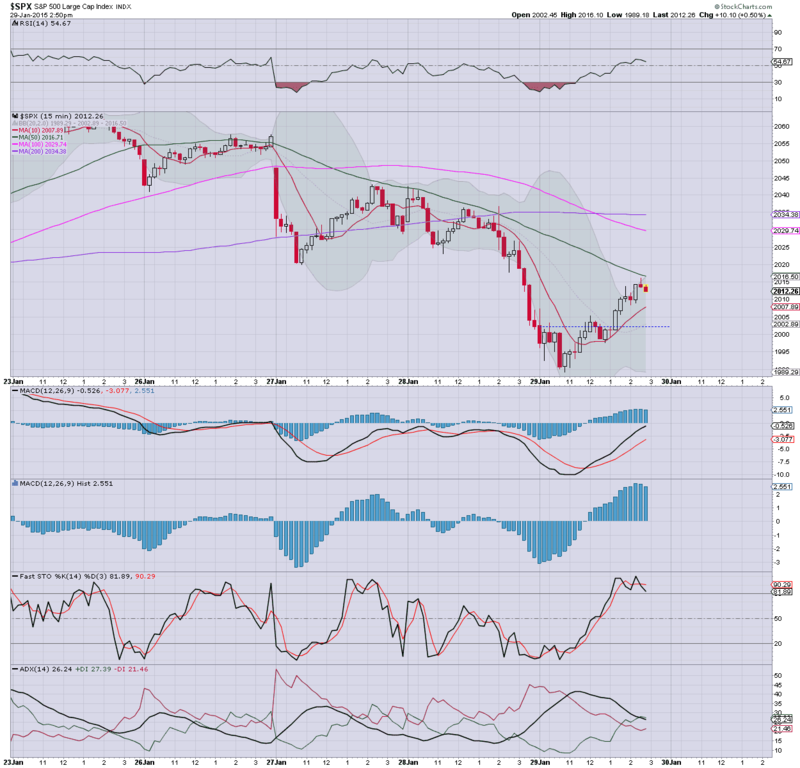 As for equities... the mood out there sure isn't great, a hit of the 200dma @ sp'1973 looks more probable than not.. before the next opportunity of renewed upside. US equities are testing the recent micro double low of sp'1988.. but price action remains dowdy, and there is high opportunity for the bears to make a play for the 200dma @ 1973. 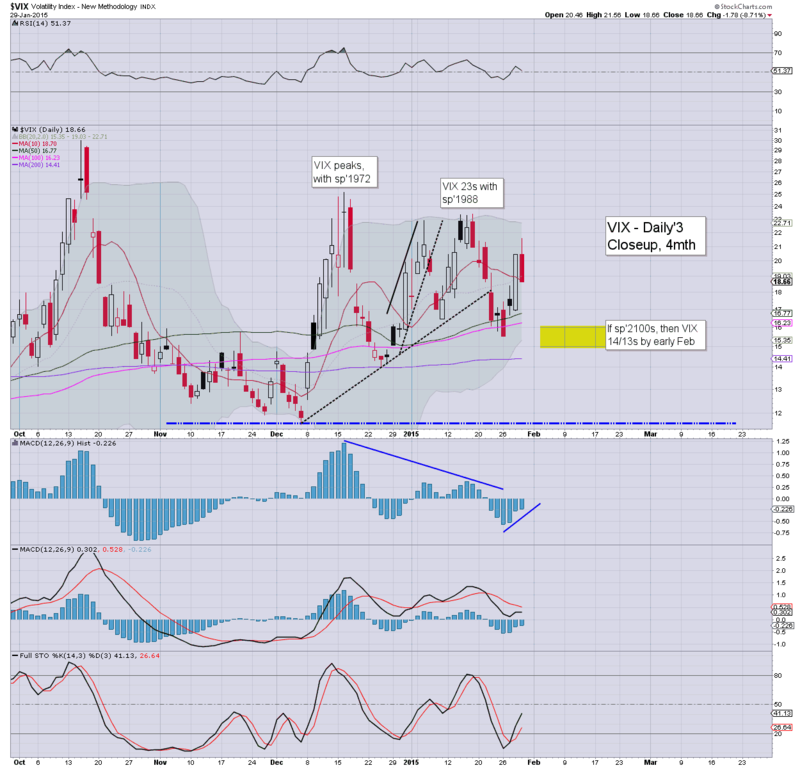 VIX is confirming the mild market concern, +4% in the 21s. Metals remain weak, Gold -$20. ... suffice to say... it ain't so pretty. A fail of 1970s to hold.. will open up the 1920/00 zone next week. Notable weakness, FCX -5% in the $16.50s.. takes out the low from May.. 2009.... incredible. 11.13am.. 3 spiky hourly candles... offering a sub'3 wave floor of sp'1989. I suppose some could look for a sub 5' late today/early tomorrow.. for a brief test of the 200dma (1973).. before powerful rebound. 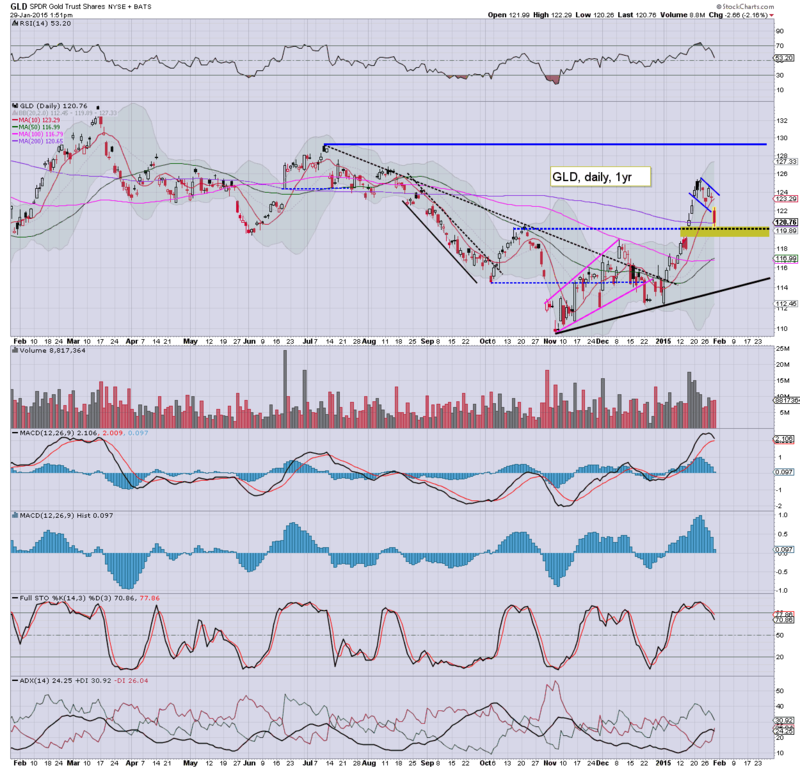 more interesting though... Gold -$25 (-2.0%).... a multi-week peak looks to be in... holding to broader targets for the summer. *the weather this afternoon in London city... just lousy. Grey gloom, rainy... windy.... about as depressingly awful as it gets. I guess it must be like what Seattle is like all year, gods help them! So... 2k fails... and market is showing ZERO sign of leveling out. The only hope for the bulls is a good GDP data point tomorrow, but by then.. .we could be in the sp'1980/70s. Lets be clear, if the 200dma fails at 1972... the next support is not until the lower weekly bollinger... around 1910. A hit of the latter.... would open up much lower levels in the spring. As ever.... in order to turn the bigger picture bearish, how we close the week and month is what really matters! Relatively good earnings, but not good enough to avert a sell down. Good morning. Futures are flat, we're set to open at sp'2002. Equity bears look set to break the 2k threshold, with a viable hit of the 200dma (1972) before the weekend. Metals are on the slide, Gold -$14, with Silver -2.5%. Oil is bouncing a little, +0.5%. So.. after yesterday afternoons unravelling, what about today? Certainly, hourly cycles are still offering a turn in the immediate time frame... but it'd be surprising if we don't continue lower. The giant 2k threshold looks set to be lost this morning... which will open up a test of the 200dma in the low sp'1970s. 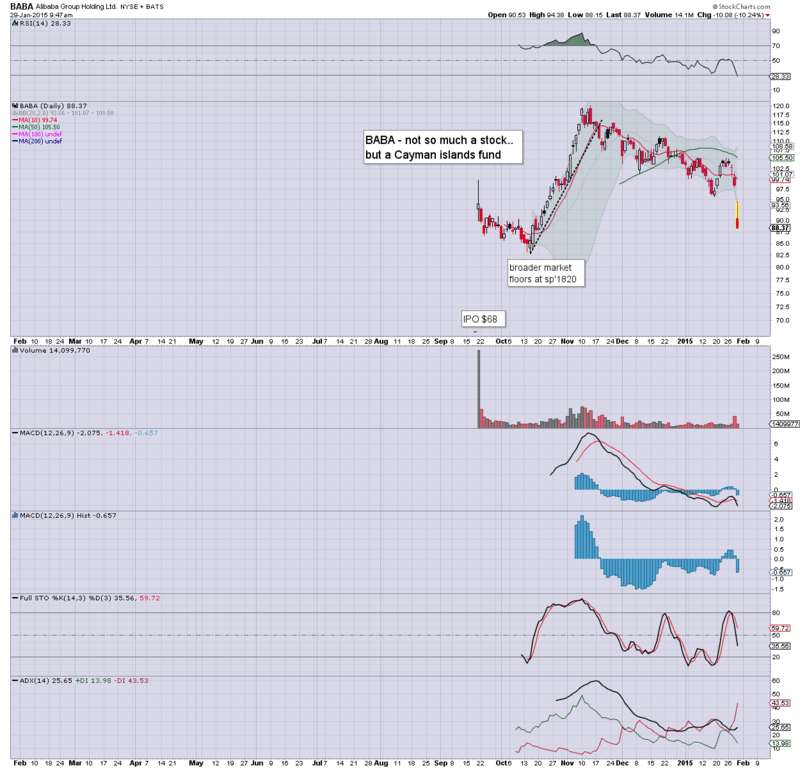 Notable weakness, QCOM, -7.5%, post earnings. I still favour the company though, one of the top 10 techs in my view. 9.43am.. Well, 2k is broken under... if briefly. right now, the one hope for the bull maniacs is a good GDP number >3%. Anything in the 2s tomorrow would be pretty disappointing. More than anything that I've noticed in the past few months, is how twitchy everyone gets when the market is not making a new historic high in any given day. Even moderately lower opens of sp -0.5% seem to give many the proverbial 'heebie jeebies'. Those suffering from such concerns... should go stare at the following two charts for a good ten minutes each. *sure, the current monthly candle for the Dow will likely see rather significant net monthly declines, but the key 17k threshold is still holding as strong support. 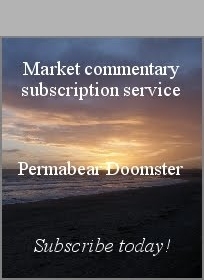 Without question, unless the market puts in a new historic high in a given day, the crash calling maniacs are out there... on the loose, touting their relentless (and largely.. .baseless) nonsense. Ironically, even the cheerleaders on clown finance TV are almost as twitchy. Remember how in early 2013, the cheerleaders were already calling for QE3 to end in Feb/March... and were extremely concerned about major downside? 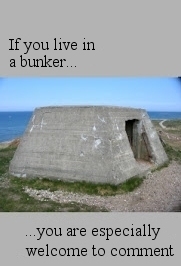 I sure remember, but seems most haven't. 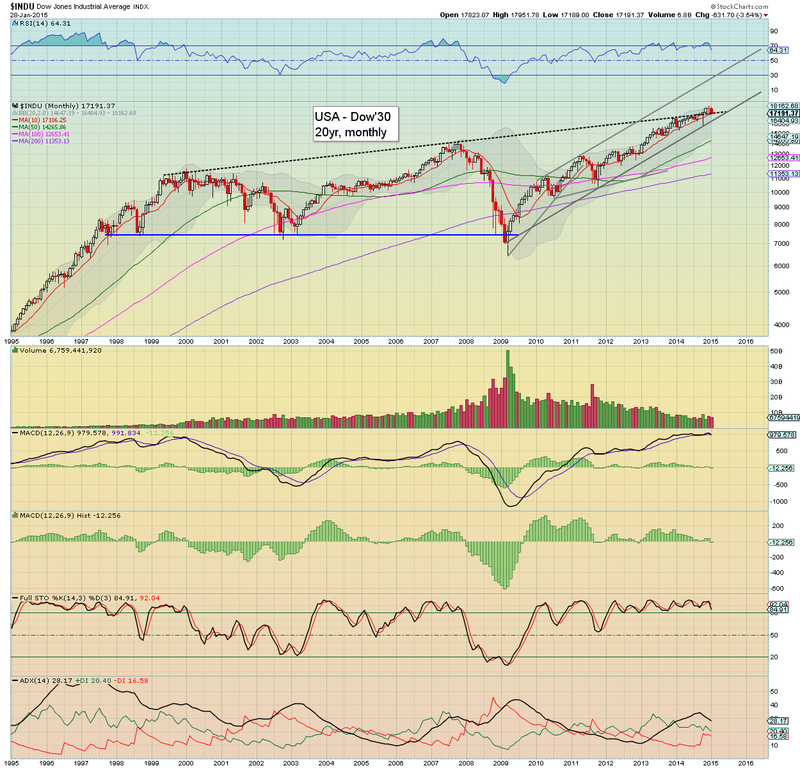 Now, here we are... still holding the sp'2000s... and still so many are real twitchy with each down tick. How can this be with quality stocks like AAPL having a PE in the 9s? Seriously, this remains one bizarre market in so many ways.. and until stocks like AAPL are at least DOUBLE what they currently are, this is no bubble top. Hell, the true 'bubble phase' hasn't even started yet. Thursday will see the usual weekly jobs data and pending home sales. In the scheme of things... not much of importance. Market will have eyes on Friday.. when GDP for Q4 is released. US equities closed significantly lower, sp -27pts @ 2002 (intra low 2001). The two leaders - Trans/R2K, settled lower by -1.5% and -1.6% respectively. Equity bears have had to battle hard just to get close to the 2K threshold. With renewed weakness, the 200dma in the sp'1970s is now within range before the weekend. *the closing hour was a real failure for the equity bulls. So, we had opening moderate gains.. quickly failed, with a low of sp'2019. A little rally, but with another cycle low after the FOMC announcement (lower Oil prices greatly helped achieve that).. with a particularly bearish closing hour. 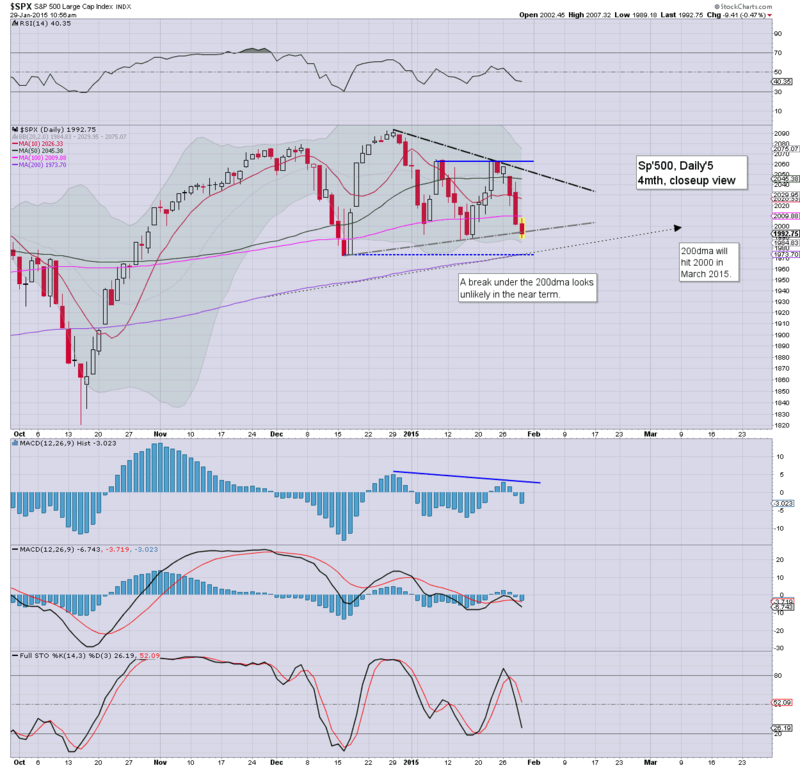 Daily cycles now look rough into the weekend... with the 200dma in the sp'1970s now viable.. before another push higher. Price structure is a real mess. As many recognise..the waves are overlapping, and trying to count this nonsense is arguably pointless at the moment. I don't see a H/S formation, more a market that has been consolidating sideways since early December. With ECB QE-pomo set to start in March... the bears face major problems this spring. For now.. this remains a real choppy.. and 'somewhat' volatile market... but one that is STILL close to historic highs.